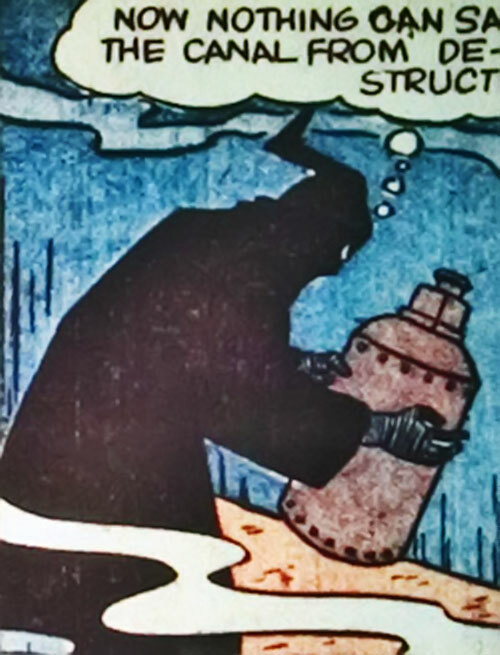 AFAIK, the Ghost of the Deep only appeared in America’s Greatest Comics #1, whose lead story begins with these words : “In a secluded laboratory, hidden somewhere in the vast metropolis, a weird cloaked figure watches silently as a scientist works feverishly to discover a new formula.” The weird figure is the Ghost, and the scientist (Hugo) completes his formula only to be then killed by his employer (the Ghost). 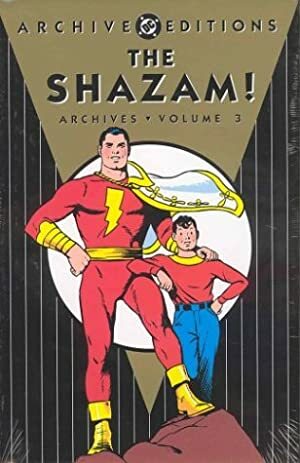 Later, Billy Batson reports on the death of the “scientist known only as ’Hugo’”. He then reports on the strange sinking of various boats on the west coast, strange because it is not known which government is responsible, though a message is found after each sinking : Compliments of the Ghost of the Deep ! Billy Batson then reassures his listeners that Captain Marvel will be heading out west to take care of the Ghost. Later, Mr. Morris (head of Amalgamated Broadcasting) gives Billy a ride home, only to be forced off the road by some German thugs who capture Billy and Mr. Morris, stating their intention to take the two to the Ghost. Billy becomes Captain Marvel and throws the thugs off a cliff to the ocean below. The Ghost of the Deep then swims up to and sneaks up on these thugs, and kills them for having failed him. Later, Mr. Morris casually comments to a passerby that Captain Marvel is headed to the west coast. The passerby reveals himself to be Spriggins, chief newscaster of Morris’s rival The Monopoly Broadcasting Company. Morris worries that he’s given away secrets to his rival, even though Billy already announced Cap’s plans earlier on the air. 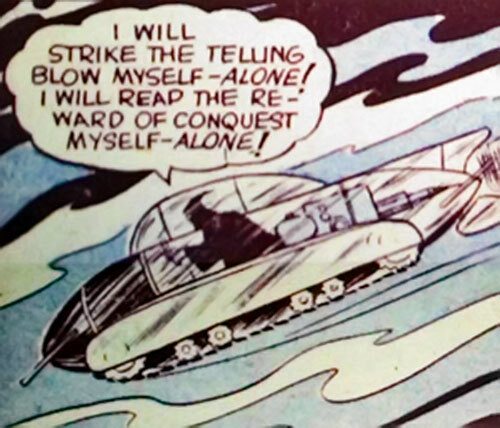 Billy then plans to reassure the country further about Captain Marvel’s plans, but his broadcast is interrupted by the Ghost who announces his own plans, namely to attack where the country’s defenses are weakest. Spriggins later meets up with Billy ; his radio broadcasts have also been affected by the Ghost, so the two decide to team up against the Ghost. “Naval authorities” tell the pair that their most vital defense area is at the Panama Canal. While Billy assumes the Ghost will strike there, Spriggins states his opinion that the Ghost will more likely strike in Canada, so the pair split up. all alone, in tiny little boats. It should come as no surprise that Billy is ambushed by the Ghost, who drags him off the boat and down into the water. which seems entirely the wrong order to do things in. Once Billy is conscious, the Ghost explains that this Tank is made of indestructible Z-Metal (no explosion can so much as dent it). The Ghost then leaves in another Tank to blow up the canal, leaving two thugs behind to guard Billy. One of these goons decides to have some fun. He removes Billy’s gag to play a weak joke on Billy involving a slice of pie. Billy of course becomes Captain Marvel, fights the goons, and finds the indestructible Z-Metal to be “just like cellophane”. Cap breaks out of the Tank, and leaves the goons to fend for themselves. As they flounder, commenting on their inability to swim, the Ghost arrives and kills them for their failure. but Cap arrives just in time to stop him. 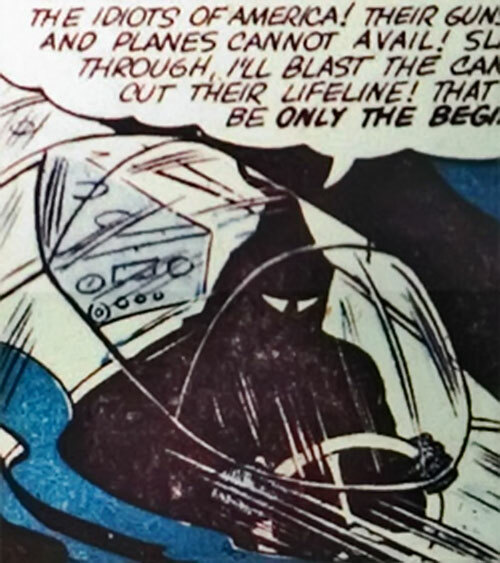 Cap slugs the Ghost, and smashes the Ghost’s hidden armor that he wears under his robe. Cap turns the Ghost (who turns out to be Spriggins) over to the authorities, but Spriggins steals a gun and shoots at a “big shot General”. Cap intervenes (with Superspeed ? ), and the bouncing bullet strikes Spriggins, apparently killing him. He wears a black robe with a pointy (KKK-style) hood, which reveals only white pupil-less eyes. His hands are covered in a chain-mail style armor. In fact, his entire body is covered in this armor underneath the robe. He also wears ordinary shoes. In the pre-Crisis Universe, the Z-Metal would have to be scaled up to a 25 BODY. OTOH, in a post-Crisis universe, Captain Marvel would not have fought the Ghost ; instead it is more likely that Bulletman or perhaps Alan Scott would have fought him. Bulletman might (sometimes) be strong enough to take Cap’s role, while Alan Scott would likewise be appropriate, since his ring gives him mastery over metal.